Photo of the Week. The Big and Little Dippers swing around Polaris, toward lower right. Draco winds between the two, wrapping itself around the Little Dipper. Thuban is just up and to the left of center. The reddish star just down and to the left of it is 10 (CU) Draconis. Astronomy news for the week starting Friday, May 15, 2009. As quiet as last week was, this one is busy. Begin with the third quarter Moon, which takes place the night of Saturday, May 16th (actually the morning of the 17th), roughly around the time of moonrise in North America. The Moon then spends the remainder of the week in its dimming, waning crescent phase, new Moon not reached until Sunday the 24th. 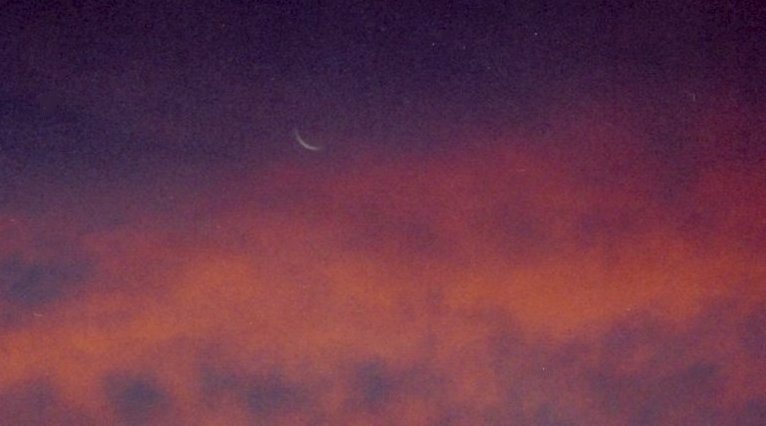 Watch as the slimming crescent rises ever later in the morning hours and as Earthlight develops on the nighttime side. Following third quarter, the crescent then undergoes a remarkable series of planetary conjunctions, beginning on the morning of Sunday the 17th with Jupiter, when the rising Moon will be three degrees to the north of the giant planet. Then look the morning of Wednesday the 20th to find the Moon well up and to the right of brilliant Venus. The next morning, that of Thursday the 21st, presents an even better sight, with the Moon making a fine triangle with Venus, which will now be down and to the right of it, much fainter reddish Mars down and a bit to the left. Formal conjunction between the Moon and Mars takes place during the daytime. In between, the Moon passes north of Neptune the morning of Sunday the 17th and then takes on Uranus two days later. Clearly, the morning holds the planetary glory, with Jupiter now rising just before 2 AM Daylight Time, Venus coming up around two hours later, just before 4 AM, coincident with the onset of dawn, by which time Jupiter has moved well into the southeast. Though Venus passed its greatest brilliancy for the rest of the year, the view continues to get better. On the other hand, the other planet inside Earth's orbit, Mercury, is quite gone from view, as it passes inferior conjunction (between us and the Sun, though not directly) on Monday the 18th. Switching over to the evening sky gives us Saturn. Crossing the celestial meridian to the south just around the time of sunset, the planet will have moved into the western half of the sky by the time twilight fades enough for it to be visible. Still in southeastern Leo to the east of Regulus along the ecliptic, Saturn finally stops its retrograde motion on Sunday the 17th, and ever so slowly begins to move back in the other direction, to the east as it heads toward the next constellation of the Zodiac, Virgo. Up a good part of the night, Saturn sets between the rising times of Jupiter and Venus. As twilight ends, the Big Dipper of Ursa Major lies nearly overhead. Farther down, the handle and bowl of the Little Dipper of Ursa Minor, marked well by prominent Kochab and Pherkad, stretches up to reach it, all circulating around Polaris, which lies near the North Celestial Pole. 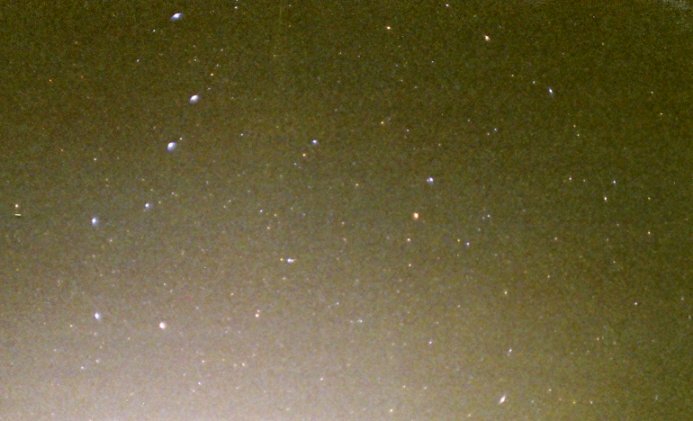 Find Mizar, the second star in from the end of the Big Dipper's handle (while looking for nearby Alcor, the two making the Arab's "Horse and Rider"). Thuban, Alpha Draconis, which as a result of precession was the pole star some 4700 years ago, lies between the it and the Little Dipper's bowl.